The story is written in the present tense which gives it a nice "here and now" flavour. The language is excellently geared towards 7 to 12 year olds. It also has a really good evil man, the discipline teacher Mr Kong. I won't tell you more than that because it would spoil the story. 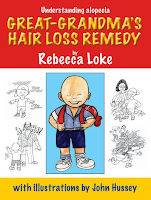 Rebecca wrote the tale as her son Ethan has alopecia. She hopes this tale will raise awareness, and is it is a charming story, no doubt it will work nicely. I also really enjoyed reading a tale that has Malaysian characters. John Hussey illustrated the book with rough black and white sketches. You might leave them as is, or encourage younger kids to colour them in. This book is a very good example of what "edutainment" (excuse the vulgarity, but it is the mot juste) should be about. 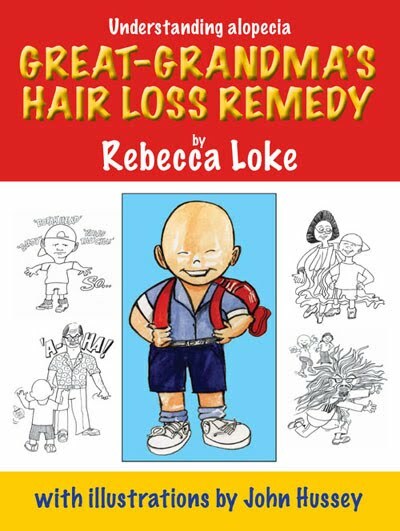 One thing that niggled a bit: the back 2 pages have an alopecia FAQ. It's excellent in terms of information but the language is far more lofty than the story. I don't think a 7 to 12 year old would understand it. In the next edition, I'd think about toning it down so it matches the story. Also, it needs to be presented in paragraphs, not in big blocks as it is now. All in all though it's a jolly good read: and an excellent small gift for a kid. Maybe the FAQ is intended for parents and teachers! I love books like these, which help raise awareness on medical conditions and so forth. There's a whole series of books meant for children on autism, hearing disability, epilepsy etc which would help them understand and empathise with their differently-abled peers better. I'm looking for a series of eco books for kids. Any ideas??? Latest local publications: Rhino Press' Eco Kids series by Asha Gill and someone else -- Faye Khoo, I think. Very simple plot, excessively simple outcomes, but attractive illustrations. Suitable for those under age 9. 9 - 10 above will start questioning the moral of the story and the consequences too much.